The stone I finished yesterday, adorned with delicious little handmade clay beads from my neighbor Haddie up the road. One of a handful I'm sending off to the Sheldon Museum of Art's shop in November. It reminds me of the jungle reclaiming long-forgotten relics like the ruins I saw in the jungle in Belize, tucked away in the vegetation. Our guide explained that there were ruins all over, there were so many that they were commonplace, nothing special. It was anything but commonplace to me. I love the feeling of discovery, it speaks to my inner explorer. I always wanted to be Jacques Cousteau or Indiana Jones when I grew up. When we were kids, my cousins and I would dig up blue mason jars, molasses jugs, Victorian button-up shoes, and more from alongside the railroad tracks. These things filled us with excitement. Far from ordinary, far from commonplace, these were real treasures. Now my discoveries are found in the woods and most of my excavating is done at the antique store but I still get that thrill when I find the good stuff. Treasure. How about you? Do you have an inner explorer? A treasure-hunter lurking under the surface? I've been busy this week doing a little of this, a little of that. Working a little here, a little there. Mushrooms in process, half of a fleece has been washed, small stones are getting stitches. Many days I crave continuity- the quiet and opportunity to sit down and see something through from start to finish. But then, it does feel pretty awesome when all of those projects start coming to completion all at once. Great Grandpa took the kids on a hay ride around the yard, which served as the "opening ceremony" for the day. Then there was bobbing for apples. There was a pumpkin decorating station. The kids also got to take a whack at a piñata and enjoyed the treats it spilled. 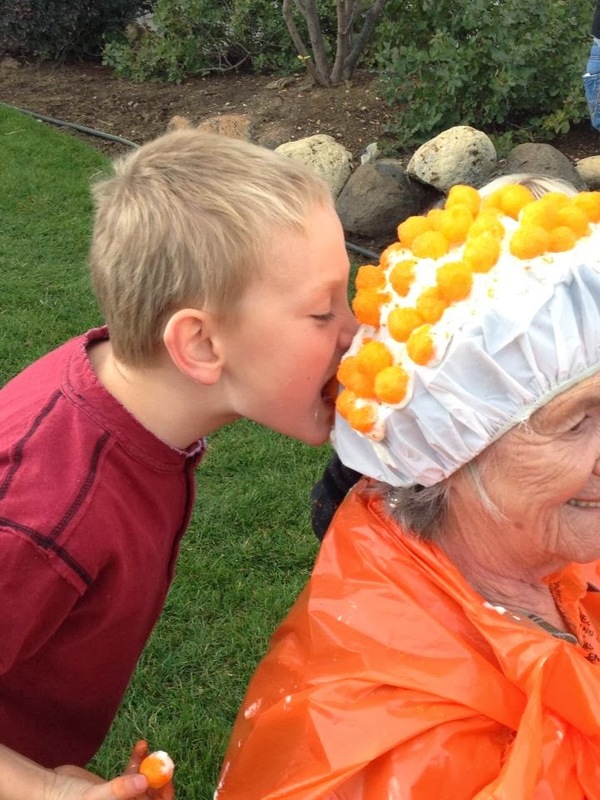 The Great Gram Pumpkin made an appearance too, oddly enough with a dollop of whipped cream on her head, towards which the kids lobbed cheese balls. Is that my child eating cheeseballs off of his Great Grandma's head? When the games were over, we all enjoyed a feast, drinks, and conversation while the kids spun about in their treat-induced frenzy squeezing whoopie cushions and hurling bouncy balls. Yesterday I shared a glimpse of a new felted piece I had just completed. I added a dash of cute to this one in the form of a wee mouse. Not just any mouse, but my very first mouse. I made him peeking out of his hole beneath the shade of an amanita. He peers out with his glass bead eyes, his whiskers a' twitchin'. He is poised to scamper out and grab some seeds to sock away for winter. I guess it's a good thing he's trapped under glass. In order to avoid using glue in my pieces, I instead drill holes through the wood base (this one a chunk of chokecherry I cut) and sew the scene to it. It's a bit of extra work, but it's a detail that I think is important. This teeny pair of mushrooms made their way to my shop yesterday too. These guys are tucked in amongst the moss and sporophytes, blades of grass and pebbles, set into a chunk of oak I brought in from my woods. Both of these have found new homes already (thank you, ladies!) but I enjoyed them so much I have a feeling I'll be working on others soon. Scampering into the shop soon. Yesterday my friend Molly had a crash course in nuno felting and natural dyeing. She came over with that Starbuck's pumpkin spice latte in her hand and an eagerness to learn, and though I thought the PSL was only so-so, I think her scarf turned out wonderfully. Wanting to make a shade of grey, we looked for tannin-rich materials that we could afterdip with iron. A walk in the woods yielded oak leaves, acorns, twigs, barks, and a smattering of different leaves that went in the dye pot to simmer. We dyed her scarf at the pre-felt stage, that is the fibers started to hold together but weren't completely felted yet. That allowed her to add a few little undyed locks and some lines of fiber I had previously dyed before finishing the felting process. The leaf-like shapes were small pieces of silk that had been felted in. I love how they took up a different color than the scarf itself. And I especially love how happy she was with the end result. A new lathe, on loan to us, that has been keeping my husband's hands busy. A step up from our small lathe that has opened up new possibilities. I am very excited about this, and not just because I collect wooden bowls, (though that might be a small factor), and not just because I get to keep all of his "proofs of concept" (though I do enjoy that too). Last week my friend took me to a lecture on Hinduism, something new to me. Today I'll be teaching her how to nuno felt, something new to her. She's bringing some Starbuck's pumpkin spice lattes with her, something new to both of us. I have some stones bundled up in leaves, inspired by the inimitable India Flint, whose book I treated myself to a few weeks ago and have been ogling ever since. She's an alchemist, to be sure. This world is so big and there's so much to learn. Have you done anything new lately? It's been many months since I last finished a stone for my project. Life got very busy and I set it aside for a while, but it was always in the back of my mind. I found myself reaching into the box this weekend and pulled out this stone sent to me by Kristin who writes the delightful blog Kleas. I had the pleasure of meeting Kristin in person one summer at her cabin on the lake. She was such a warm, genuine person. We talked about mushrooms and watched as the kids splashed in the water. It was a lovely visit. Kristin included some plant-dyed wool and a small doily in her package so I incorporated those in her stone. The doily sits just under the surface of the pretty blue wool and my stitches roughly highlight its shape. The inspiration for this stone came from the feeling that Kristin has the ability to encircle people in light. The stitches did the work from there. The gathering of stones grows. Slowly, but it grows. I've added some new acorns to my shop today. My acorn-making is winding down for this year. The oaks are nearly bare and I'm ready to tackle new projects and ideas that have been rattling around in my head. I went on a little adventure with my youngest yesterday. Cameras in hand, we took a short walk through our woods. She's shown a lot of interest in using my camera lately so I thought it would be fun to unearth my old point-and-shoot and let her snap a few pics. These are her pictures with no editing or cropping from me. Not surprisingly, mushrooms were a favorite subject. She is my daughter, after all. She also took a few that I think perfectly captured "her". My heart swelled a little when I saw that last one, that she took looking into my dye pot. She had no worries about how to frame her shots or of lighting or focus, she just snapped away, having a good time in the process. When we were looking at her pictures on the computer she was just as fond of the blurry and out of focus shots as she was the lovely ones. I can appreciate the fact that this child, who is so adept at pushing my buttons and driving me crazy, is equally adept at reminding me to relax and go with the flow. It's like that with kids I guess. I hope you have some relaxation and fun yourselves today. Happy Thursday. If I were a month I’d be October. If I were a day I'd be Sunday. If I were a time of day I'd be dawn. If I were an animal I'd be a marten. If I were a direction I'd be northwest. If I were a piece of furniture I'd be a morris chair. If I were a liquid I'd be the water in a stream. If I were a gemstone I'd be an agate. If I were a tree I'd be a birch. If I were a tool I'd be a chisel. If I were a flower I'd be a ditch lily. If I were an element of nature I'd be the wind. If I were a musical instrument I'd be a 12-string guitar. If I were a color I'd be moss green. If I were an emotion I'd be compassion. If I were a fruit I'd be a pear. If I were a sound I'd be the breeze through the poplars. If I were an element I'd be copper. If I were a car I'd be an old truck. If I were a food I'd be Chicago deep dish. If I were a place I'd be the mossy spot beneath an ancient oak. If I were a material I'd be felt. If I were a taste I'd be savory. If I were a scent I'd be new leather. If I were a body part I'd be eyes. If I were a bird I'd be a sparrow. If I were a gift I'd be a surprise. If I were a city I'd be Chicago. If I were a door I'd be a screen door. If I were a pair of shoes I'd be worn in. If I were a poem I'd be 'Wild Geese' by Mary Oliver. Inspired by Julie's post today. If I were, as I feel today. If you join in too, let me know in the comments, I'd love to read yours.